We're seeing more progress made with our illustrious Teddy and the Yeti. Colors are nearly done and letters (which I'm learning a great deal about) are coming along, albeit a bit slowly. Along the way, certain aspects of the process stick out, but perhaps none more than the panel you see on the right. 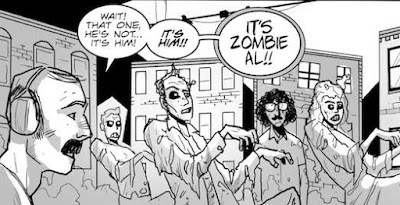 This panel has fast become my favorite of the book. Why? I don't know, truthfully. 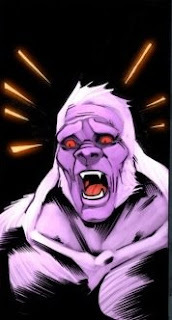 I guess I think that the expression sums up the Yeti pretty well, the colors are spot on, and...I just like it. I don't have to explain myself to you!!! Or, maybe, I do. But that's the best I can come up with right now. When I need inspiration for a script or the motivation to open Illustrator and letter some more, I look at the panel, and all seems right. I got a call from my parents today saying that they received a letter for me from the US Copyright Office. I immediately knew what it was, but I still found the timing a little bit strange. You see, when "Josh Howard Presents: Sasquatch" first came out and I was beginning to think about doing more with Teddy and the Yeti, I filled out the requisite forms and sent in a copy of the book to copyright the characters and ideas in a legal sort of way. I remember reading something about how the Copyright Office would be in contact with me and would mail my distinct number within six weeks or so. This was, oh, a year and a half ago. I guess it's a case of "better late than never", though I still do find it at least a little bit amusing. After not hearing anything for so long, I just figured that I'd never hear anything back from them, which seemed to say something about our governmental structure, but HEY! I guess things are working down in Washington after all, albeit a bit more slowly than I had anticipated. The most interesting part about all of this is that they've requested another copy of the book so they can keep it on file at the Library of Congress. Now, let's be clear: there are lots of books at the Library of Congress, and they didn't request a copy of the Sasquatch anthology because it was a priceless piece of art history (or did they...? ), but there's an odd feeling knowing that, long after I'm dead and forgotten, Teddy and the Yeti will be tucked away in some corner of a governmental library for anyone to stumble upon. Take that, future!